GM And Segway Team Up (Again) For The P.U.M.A. | OhGizmo! GM And Segway Team Up (Again) For The P.U.M.A. This isn’t the first time the General has teamed up with Segway, a few years ago the company showed off their Saturn Flextreme Plug-in Concept which featured a couple of the personal transport devices cleverly stowed in the back. But this time around the two companies have come up with a mostly new concept called the P.U.M.A. or Personal Urban an Accessibility Project. 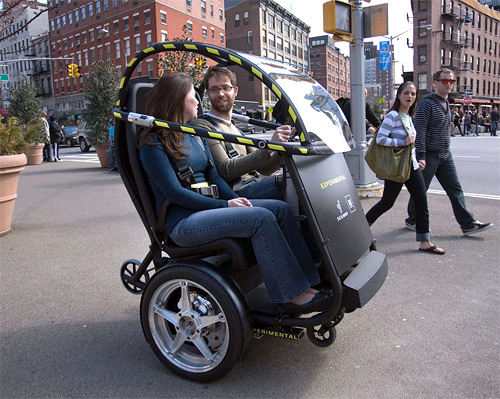 Designed for urban city centers, where traffic makes things crowded and congested, the P.U.M.A. is basically a sit-down version of the Segway that can actually carry two or more passengers (where do the ‘more’ sit?) with a top speed of 35mph and a range of 35 miles. It’s also got vehicle-to-vehicle communications and autonomous driving and parking functions which is no doubt meant to increase the safety factor if we eventually end up with these things zipping around our cities. Not surprisingly the P.U.M.A. is still in the experimental phase right now, but you can check it out in person at the NY Auto Show this week. What do you mean it doesnt come with a Mr. Microphone??? How else am I going to tell good looking chicks I will be back to pick them up later? It is a great news General motors has teamed up with Segway. Definitely they provide good range of products.